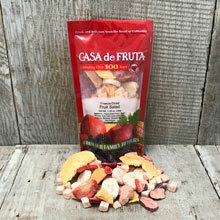 Crunchy Freeze-Dried Fruit Salad has pears, apples, peaches, bananas, strawberries, and grapes, with no added sweeteners or preservatives. Packaged in a 1.25 oz. bag.